Plan your Christmas season, with all the events listed in one convenient place! And we'll update it all month long, as needed! If I omitted your event, please let me know and I will add it! Check out the Ocracoke Current calendar for more events and information! Live Music at Ocracoke Oyster Company! Martin and Friends will play 6–9pm. Good times, great tunes! OPS Wassail Party and Community Tree Lighting. 4–6pm at the OPS Museum. Enjoy performances by the Ocracoke Children's Choir, and delicious wassail and treats. OPS will draw the winning ticket for the 2018 Quilt Raffle! Shop at the Museum gift shop for great holiday gifts. FREE and festive! UMW Christmas Dinner at Ocracoke Community Center, 6pm. All the women in the community are invited to join the potluck. It's one of the loveliest evenings of the year! Please come and bring your favorite dish and a small gift to exchange. Donations welcome for one of the many special causes supported by the UMW. Island Trivia @ Gaffer's, 7pm. $2 to play; teams are comprised of up to 4 players. This week's proceeds will benefit Ocracoke School's PTA. Come out and show off how smart you are! Pictures with Santa!! 3–5pm at the Variety Store. The Jolly Old Elf will pose with kids from 3–5pm. Photos are a gift from the Variety Store. NEW for 2018! Children may bring their letters to mail to Santa in the special mailbox at the Variety Store. Kids' Christmas Craft at the Community Center, 9–11am. Parents' morning off! For just $10 per child you can drop the youngens off with Ocracoke Child Care volunteers so they can make a holiday gift! This event is a fundraiser for Ocracoke Child Care, which could re-open as early as spring 2019. Library Cookie Swap, 1pm at Ocracoke Library. Bring a dozen or more cookies to share; take home the same amount of assorted goodies! Yum! Pre-swap entertainment will be provided by Ocracoke School's 5th grade class. Dance with the Ocracoke Rockers at the Oyster Company, 7–10pm: A special fundraiser for Ocracoke Health Center. $10 admission includes 1 raffle ticket. Raffle prizes are gift certificates to local businesses! Free homemade desserts will be provided by Ocracoke Health Center staff. The island's only clinic, serving both residents and visitors, needs to raise money for major repairs to the building. POSTPONED DUE TO WEATHER -- NEW DATE TBA: Holiday Historic Homes Open House, 3–5pm. This fun holiday tradition features six houses in the Silver Lake Drive/Windmill Point area this year! Have you ever wanted to see the inside of a mysterious or renovated historic island home? Now is your chance! This is a festive event complete with finger food and beverages. Tickets are $15 or just $10 for OPS members. The Hyde County Tram will provide free transportation from the NPS parking lot to the Homes Tour area. Questions? Call 252-928-7375. Ocracoke School Christmas program, 7pm in the gym. Singing, dancing, acting, cuteness overload and holiday cheer! Also, tasty treats! This annual event is the school's gift to the community for all its wonderful support all year. Holiday Basketball Tournament @ Ocracoke School gym. Details and game times TBA. Ocracoke Shopping Day! Noon–4pm. Shop local! This event is sponsored by OPS. Ocracoke School's 1st and 2nd grade classes will have a gift wrapping fundraiser at the OPS Museum for you holiday wrapping needs. Ten unique Ocracoke businesses – Over the Moon, Island Artworks, Village Craftsmen, Ride the Wind, Downcreek Gallery, Pirates Chest, Mermaid’s Folly, Island Ragpicker, Books To Be Red, and the OPS Museum Gift Shop – will be open from Noon–4pm. POSTPONED DUE TO WEATHER: "Twinkle and Lights" Holiday Decorating Contest, 6pm. Make sure your lights are up and turned on Saturday evening. Judges will drive around Ocracoke village to determine who has the best holiday lights! The categories include: Best Theme, Most Original, Most Traditional, Best of Show, and Business Best of Show. The winners of each category will receive a yard sign proclaiming their achievement, and a year's worth of bragging rights. Community Christmas Concert, 7pm at Community Center. Performers of all ages! Admission is a non-perishable food item for the Bread of Life food pantry. Bring some cash – Ocracoke School's 5th grade will be having a bake sale. There will also be a special fundraiser for hurricane and wildfire victims. Christmas Program at Ocracoke Assembly of God Church, 6pm. The annual Christmas program features music and worship offered by the kids and adults. Lots of tasty treats afterward to fill you tummy. Great fellowship, too! All are welcome! NEW DATE! "Twinkle and Lights" Holiday Decorating Contest, 6pm. Make sure your lights are up and turned on Saturday evening. 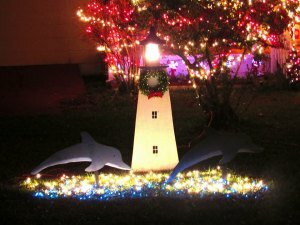 Judges will drive around Ocracoke village to determine who has the best holiday lights! The categories include: Best Theme, Most Original, Most Traditional, Best of Show, and Business Best of Show. The winners of each category will receive a yard sign proclaiming their achievement, and a year's worth of bragging rights. Holiday Open House at Village Craftsmen, 10am–5pm. Offering special deals on many items from 10-5 with savory hors d'oeuvres and tasty holiday beverages available starting at 1pm. Christmas Caroling, meet at Methodist Church at 5pm. Chili supper after the caroling, hosted this year at the Methodist Rec Hall. Join in the singing and spread the Christmas joy! Island Trivia @ Gaffer's, 7pm. Just $2 to play (teams can be comprised of up to 4 people) and all proceeds benefit the Ocracoke School PTA. Show of your smarts! Live Nativity in front of the Methodist Church 5–6pm. A beautiful, silent tableau of the Holy Family, Angels, Shepherds, and Three Kings. Drive by or stop and ponder the grand mysteries of the season. From Hatteras: 5, 6, 7, 8, 9, 10 and 11 a.m., 12, 1, 2, 3, 4, 6 and 9 p.m., midnight. From Ocracoke: 4:30, 6:30, 7:30, 8:30, 9:30, 10, 10:30 and 11:30 a.m., 12:30, 1:30, 2:30, 3:30, 4:30, 5:30, 7:30 and 10:30 p.m.
From Ocracoke: 1 p.m. and 4:30 p.m.
From Cedar Island: 1 p.m. and 4:30 p.m.
From Swan Quarter: 4:30 p.m.
Christmas Eve service at the Methodist Church at 7pm. Led by the youth, this special service features the adorable children's Christmas pageant, and candlelight singing. From Hatteras: 5, 6, 8, 9 and 11 a.m., 12, 2, 3, 6 and 9 p.m., midnight. From Ocracoke: 4:30, 6:30, 7:30, 9:30 and 10:30 a.m., 12:30, 1:30, 3:30, 4:30, 7:30 and 10:30 p.m.
Festive Holiday Wine tasting at Zillie's Island Pantry, 6pm. Wine tastings pair five great wines with delicious hors d'oeuvres from the pantry. Space is limited, so make a reservation, and sign up at zillies.com. Ocracoke Working Watermen's Oyster Roast, 2pm. This amazing annual party starts 2pm at the Ocracoke Seafood Company Fish House. Steamed oysters, steamed shrimp, fried drum or sheepshead sandwiches, Vince's homemade hush puppies, raffle items, and live music! Walk around the harbor for hot cider and homemade dessert around the woodstove at the Working Watermen's Exhibit, 3-6pm. Dance with the Ocracoke Rockers @ Ocracoke Oyster Co., 8pm Woo! No fools, no fun! Zillie's/Berkley Manor Holiday Wine Dinner, 6pm. Zillie's will be pairing the five-course menu prepared by chef Christopher Johnson with superb wines from Tyron Distibuting Company, presented by Della Basnight. Space is limited. Sign up here. Live Music! Ring in the New Year at Ocracoke Oyster Company with the Ocracoke Rockers! No fools, no fun! The band starts at 8pm.